As a young man, there were few things cooler to me than tanks. Sure, I wanted to be a pilot at the time, with visions of fighter jets dancing in my head. But armored warfare and the cool and advanced designs of modern MBTs (Main Battle Tanks) were never far behind. And so I thought it was high time I did a post dedicated to the world of these behemoths and what the current crop have to offer. Originally invented in World War I as a means of infantry support, tanks quickly evolved over the ensuing decades to become a distinct and fearsome weapon of war. In 1917, they were deployed as a means of breaking the stalemate caused by trench warfare, and were little more than lumbering, thinly-skinned land fortresses. But by 1939/40, their use as fast, cohesive offensive weapons that could break through enemy lines and encircle entire armies was demonstrated. Throughout the Second World War, tanks continued to evolve to sport heavier armor and guns with increased size, range, and muzzle velocity. By the end of the war, some truly interesting designs had been produced by all sides, ranging from the light to the super-heavy. But these were largely abandoned in favor of designs that could be mass produced and had a good balance of speed, durability, firepower and protection. And by the 1970’s, the Cold War spurred on numerous developments that would culminate in the c0ncept of the MBT. These included the development of lighter, composite armor and advanced anti-armor systems. In addition, the MBT concept was intended to fill the heavy direct fire role of modern armies and replace the light, medium, heavy and super-heavy tanks that were common. Named in honor of General Philippe Leclerc de Hauteclocque, who led the French element of the drive towards Paris during World War II, the AMX Leclerc is The Main Battle Tank of France. Beginning production in 1991, the tank is now in service with the French Army, the army of the United Arab Emirates, and is also renowned for being the most expensive tank in history. The hull and the turret are made of welded steel fitted with modular armor, which can be replaced easily for repair or upgraded over the years. 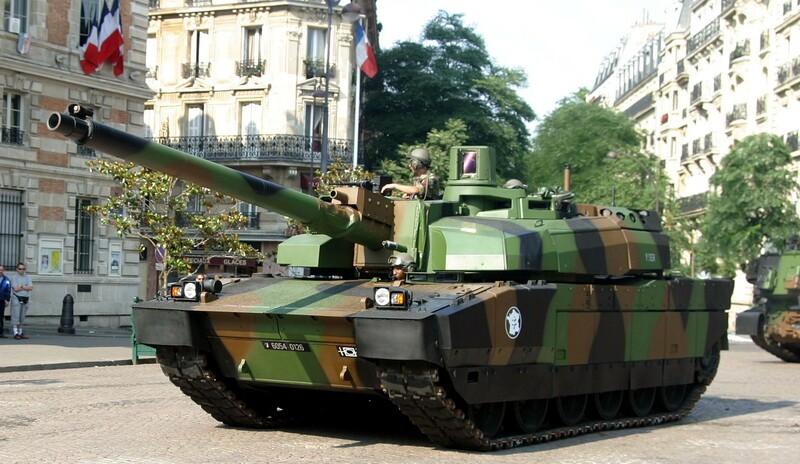 Unlike other NATO tanks, the Leclerc does not use the standard Chobham composite armor and relies instead on a French variant that includes composite armor, titanium inserts on the sides of the turret, and Explosive Reactive Armor (ERA) blocks. It’s eight-cylinder 1,000KW (1,500 hp) diesel engine can achieve a top speed of 72 km/h (45 mph) and it has an operational range of 550 km (342 mi) or 650 km (400 mi) with external fuel tanks. 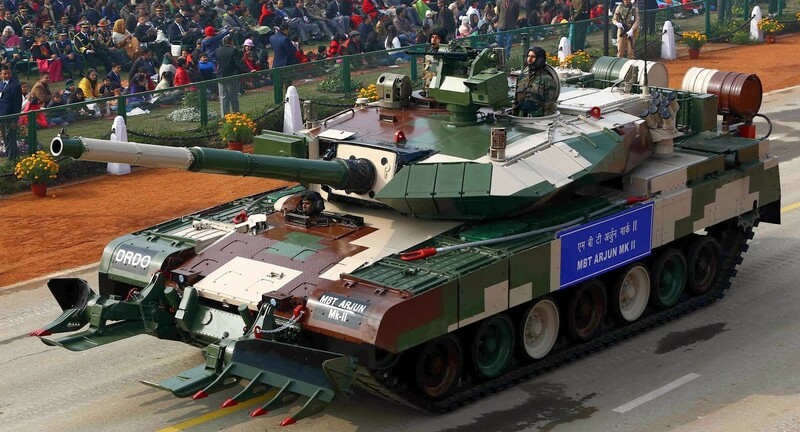 The MBT of India and produced by the Defence Research and Development Organization (DRDO), the Arjun is named after the main protagonist and world’s greatest archer from the Indian epic, The Mahabharata. Design of the tank began in 1974 as a way of providing the Indian Army with an indigenously-designed and built tank. But delays prevented it from being officially developed until 2004. The Arjun sports a 120 mm main rifled gun with indigenously developed Armor-Piercing Fin-Stabilized Discarding-Sabot (APFSDS) ammunition, one 7.62 mm coaxial machine gun, and a 12.7 mm machine gun. 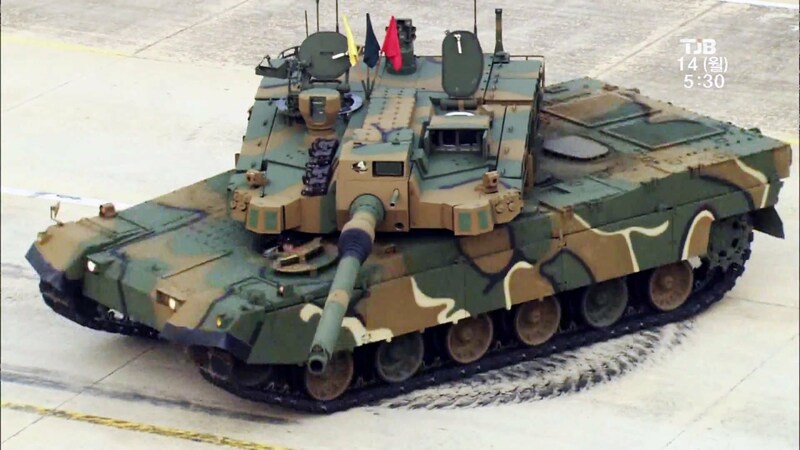 The tanks is protected by the modular composite Kanchan armor that is composed of layers of composite alongside rolled homogenous steel, and a new honeycomb design of non-explosive and non-energetic reactive armor (NERA) is reportedly being tested as well. Like most MBTs of its generation, the Arjun has a four-man crew, including the commander, gunner, loader and a driver. It is powered by a single MTU multi-fuel diesel engine rated at 1,400 hp, and can achieve a maximum speed of 70 km/h (43 mph) and a cross-country speed of 40 km/h (25 mph). The MBT of the Italian Army, the Ariete was developed by a consortium formed by Iveco-Fiat and Oto Melara (aka CIO, Consorzio Iveco Oto Melara), with the chassis and engine produced by Iveco and the turret and fire-control system supplied by Oto Melara. Development began in 1988, with the first prototypes being delivered by 1995 and the tank entering into full service by 2002. The Ariete’s main armament is a native 120 mm smoothbore cannon that uses the APFSDS-T, HEAT, and most NATO-standard rounds of the same caliber. The tank has a capacity of 42 rounds and secondary armaments consist of a 7.62 mm MG 42/59 coaxial machine gun and an additional 7.62 mm MG 42/59 configured as an anti-aircraft weapon that is fired from the hatch. The vehicle carries the latest optical and digital-imaging and fire-control systems, which include a laser range-finder, thermal optics and a digital fire-control computer that can be networked. The Ariete’s armor is a steel and composite blend, similar to the British Challenger 2 and the American M1 Abrams. The tank is powered by a 25.8-litre turbo-charged Fiat-Iveco MTCA 12-cylinder diesel engine rated at 937 kilowatts (1,250 hp) that allows for a top cruising speed of 65 km/h. The MBT of the British Army, the Challenger 2 was designed and built by the British company Vickers Defence Systems (now known as BAE Systems Land and Armaments). 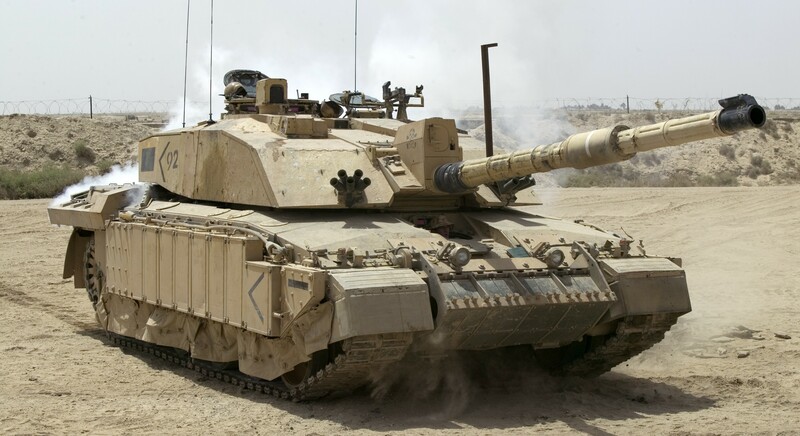 Development of the tank began back in 1986 as an eventual replacement for the Challenger 1, which served as the mainstay of the British armor forces from the early 80s to the mid-90s. The tanks main gun is the 120 millimeters L30A1 cannon which, unlike other NATO MBT’s, is rifled so that it can fire the high explosive squash head (HESH) rounds in addition to APFSDS armor-piercing rounds. The Challenger 2 is also armed with a 7.62 mm coaxial chain gun. a 7.62 mm roof-mounted machine gun, and can also mount a remote weapons system with a 7.62 mm machine gun, a 12.7mm heavy machine gun, or a 40mm automatic grenade launcher. Challenger 2 is one of the most heavily armored and best protected tanks in the world, employing second-generation Chobham armor (aka. Dorchester) that is sloped in order to deflect the explosive energy of anti-tank weapons. Explosive Reactive Armor (ERA) kits are also fitted as necessary along with additional bar armor and the tank’s shape is also designed with stealth technology to reduce radar signature. 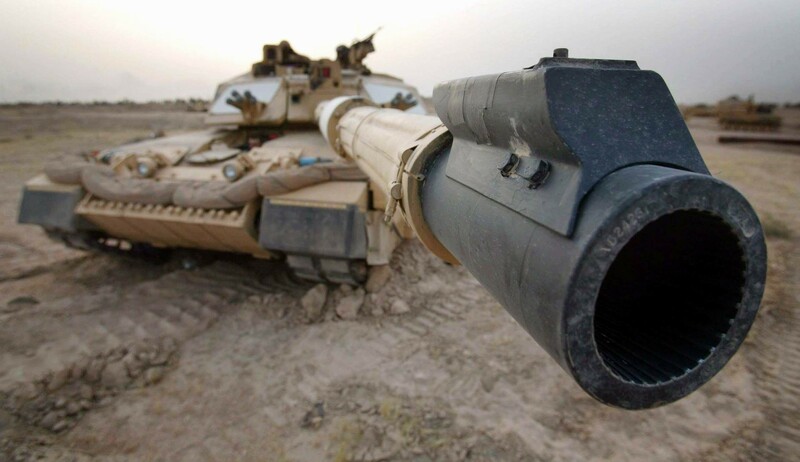 The tank’s advanced targeting systems include a laser range-finder, night vision, thermal vision, digital fire control, and the option of a Battlefield Information Control System. It’s drive system consists of a Perkins 26.6 liter CV12 diesel engine delivering 890 kW (1,200 hp). It is capable of reaching 60 km/h (37 mph) on open road for 450 km (280 mi), or 40 km/h (25 mph) cross-country for 250 km (156 mi). A fourth-generation MBT in service with the South Korean armed forces, the K2 began development in 1995 and officially entered service in 2014. Despite enjoying technical superiority over North Korea’s aging army of T-55 and T-59 tanks, the purpose of the K2 was to create an MBT using entirely indigenous technology which could also be sold on the foreign export. In terms of armament, the K2 comes equipped with L55 120 mm 55 caliber smoothbore gun that – capable of firing standard APFSDS rounds, as well as the Korean Smart Top-Attack Munition (KSTAM) anti-tank missile – a 12.7 mm heavy machine gun and a 7.62 mm coaxial machine gun. It also comes equipped with an advanced Fire Control System (FCS) linked to a millimeter band radar system along with a traditional laser range-finder and crosswind sensor. In terms of protection, the K2 employs a classified type of composite armor with ERA and NERA modular add-ons, in addition to soft-kill and hard-kill anti-missile defense systems. It also has a Radar Warning Receiver (RWR), radar jammer and Laser Warning Receivers (LWR) to alert the crew if the vehicle becomes “painted” and to deploy Visual and Infrared Screening Smoke (VIRSS) grenades. The tanks drive system is a 4-cycle, 12-cylinder water-cooled diesel engine capable of generating 1,100 kW (1500 hp), with an operation range of 450 kilometers (280 mi). Its top speed on paved road is 70 km/h (43 mph), and 50 km/h (31 mph) cross-country. 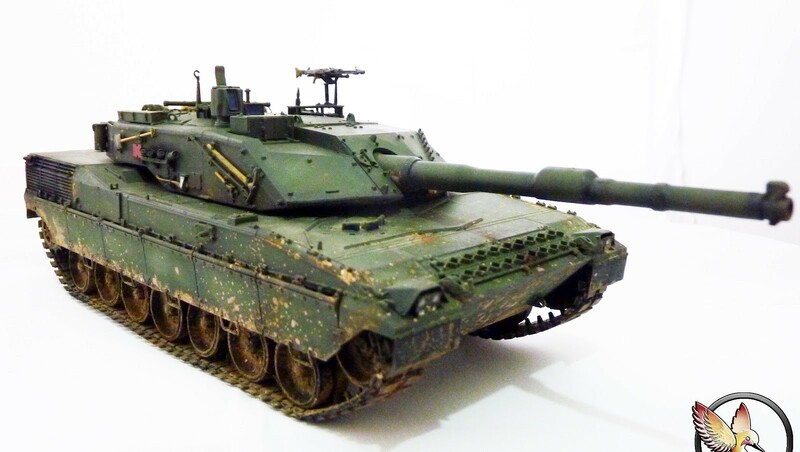 Developed by Krauss-Maffei in the early 1970s for the West German Army, the Leopard 2 entered service in 1979 to replace the older Leopard 1 models. 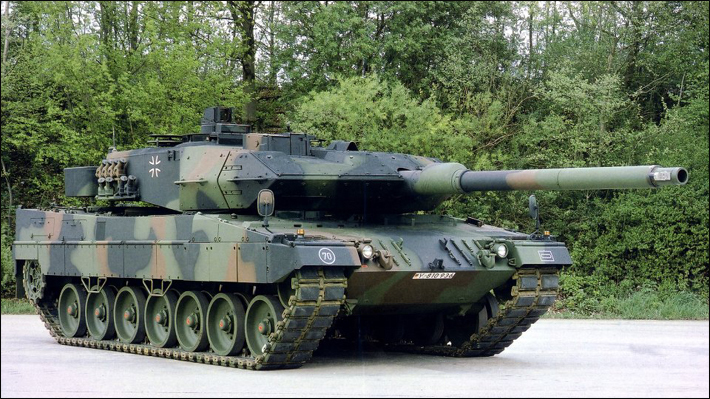 In addition to being the MBT of a united Germany after 1989, the Leopard 2 is also one of the most widely-used tanks in the world, serving in a total of 16 armies that range from Germany and Austria, to Canada, Turkey, Singapore and Indonesia. Due to improved technology, the tank has also gone through many variations. The primary gun on the Leopard 2 is the Rheinmetall L/44 120 mm smoothbore gun, which is capable of firing APFSDS warheads as well as the German DM12 multipurpose anti-tank projectile (MPAT) and the LAHAT anti-tank guided missile. It also has two 7.62mm machine guns, a coaxially-mounted one in the turret, and the other on an external anti-aircraft mount. The tank also has a stabilization system, a laser rangefinder, thermal imaging and a fire control computer. For protection, the Leopard 2 uses spaced, multi-layered composite armor that incorporates Rolled Homogenous Armor (RHA), interior spall liners and the option of slat armor on the sides to protect from Rocket-Propelled Grenades (RPGs). The Leopard 2 is also equipped with a fire protection system that automatically dispenses halomethane foam in the event that the interior temperature rises above a certain point. It is powered by a 1,103 kW (1,479 hp) V-12 liquid-cooled twin-turbo diesel engine with a fuel capacity of 1200 liters (317 gallons). It has a top speed of 72 km/h (45 mph) and an operational range of 550 km (340 mi). 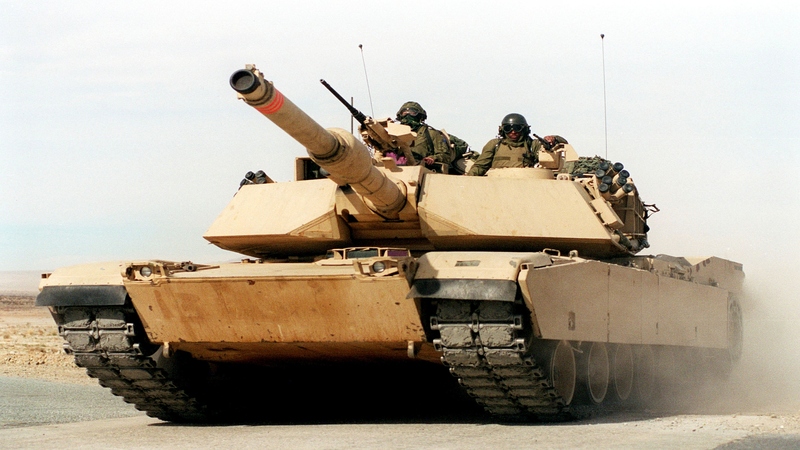 M1 Abrams: The M1 is a third-generation tank and the MBT of the US Army US Marine Corps, Australian, Egyptian, Kuwaiti and Saudi Arabian armies. Development began in 1972 and culminated in 79, with the first tanks entering service in 1980 to replace the older M60 Patton tank. Since that time, it has gone through multiple upgrades and variants in order to take advantage of the latest in technology. Though the original M1 was equipped with the M68A1 105 mm rifled tank gun, it was quickly upgraded to a 44 and then 55 caliber 120 mm smoothbore gun (variants on Rheinmetall’s L/44 and L/55 used by the Leopard 2). It is capable of firing the APFSDS and HEAT rounds, as well as the M1028 anti-personnel canister cartridge. It also comes with two 7.62mm machine guns – one coaxial and one turret-mounted – and a 12.7mm machine gun mounted by the commander’s hatch. 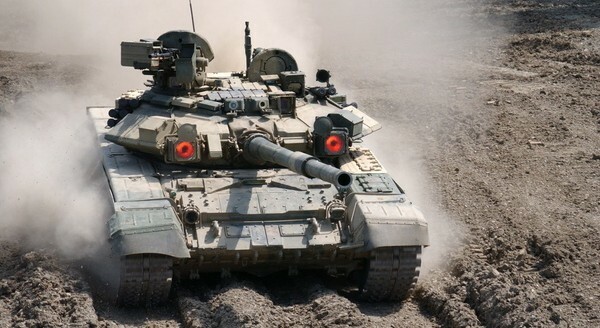 The tank also has a full-stabilization system for the main gun an comes equipped with a laser rangefinder, crosswind sensor, a pendulum static cant sensor, thermal imaging and a firing computer. The tank’s crew is protected by a halon firefighting system similar to the Leopard 2’s, and a rear ammo compartment with blowout panels that protect the crew from its own ammo exploding. The tank is protected by composite armor that is composed of alloys of steel, ceramics, plastic composites, and Kevlar, similar to British Chobam armor. It may also be fitted with reactive armor over the track skirts if needed and slat armor over the rear of the tank and rear fuel cells to protect against RPGs. 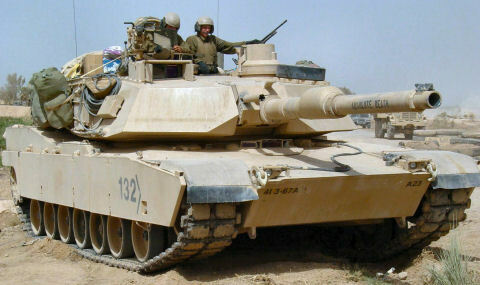 Beginning in 1987, M1A1 tanks also received armor packages that incorporated depleted uranium components at the front of the turret and hull. The M1 is powered by a 1,120 kW (1500 hp) turbine engine that is capable of running on gas or diesel with a fuel capacity of 1900 liters (500 gallons) and an operational range of 426 km (265 mi). The M1 and M1A1 have a a top speed of 67/72 km/h (42/45 mph) on the road and or 40/48 km/h (25/30 mph) off-road respectively. 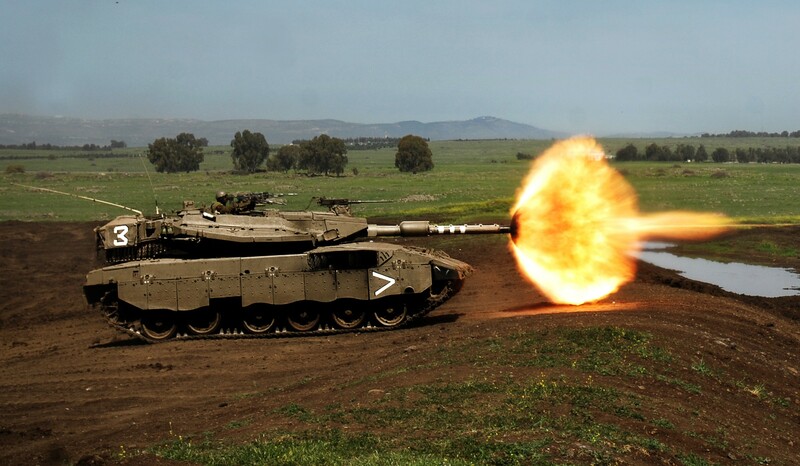 The latest MBT of the Israeli Defense Forces, the Merkava and its predecessors have the distinction of being designed with considerable input from soldiers themselves. 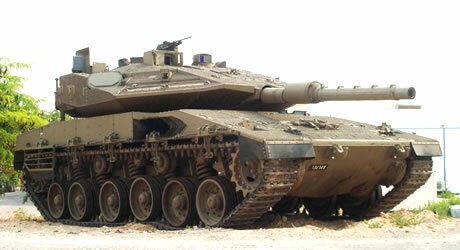 The fourth variant of the Merkava program, the Mark IV began development in 1999 and entered service by 2004. Like its predecessors, it was designed for rapid repair of battle damage, survivability, cost-effectiveness and off-road performance. Following the model of contemporary self-propelled howitzers, the turret assembly is located closer to the rear than in most main battle tanks and has the engine in front to provide additional protection against a frontal attack. It also has a rear entrance to the main crew compartment allowing easy access under enemy fire. This allows the tank to be used as a platform for medical disembarkation, a forward command and control station, and an armored personnel carrier. The Mark IV includes the larger 120 mm smoothbore gun that can the HEAT and APFSDS rounds, using an electrical semi-automatic revolving magazine for 10 rounds. It also includes two 7.62 machine guns for anti-infantry defense. a 60 mm mortar, and a 12.7 mm machine gun for anti-vehicle operations. The tank’s 1112 KW (1,500 hp) turbocharged diesel engine can achieve a top road speed of 64 km/h (40 mph). Some features, such as hull shaping, exterior non-reflective paints, and shielding for engine heat plumes mixing with air particles are designed to confuse enemy thermal imagers and make the tank harder to spot by heat sensors and radar. It also comes equipped with sectioned, modular armor that can be easily removed and replaced and carries the BMS (Battle Management System) – a centralized system that networks and shares data from all over the battlefield. A third-generation MBT that is essentially a modernization of the T-72B and incorporating many of the features of the T-80U, the T-90 is the mainstay of the Russian armed forces. Proposed as a way of creating a single design that would cost less than employing tanks at once, the T-90 sought to marry the mass-production-friendly aspects of the T-72B with the modern amenities of the T-80U. Production began in 1992 and has continued unabated since. The T-90’s main armament is a 125 mm smoothbore cannon that is capable of firing APFSDS rounds, high-explosive anti-tank (HEAT-FS), and high explosive fragmentation (HE-FRAG) rounds, as well as the Refleks anti-tank guided missile. It also comes with a 12.7mm remotely controlled anti-aircraft heavy machine gun above the commanders hatch and a coaxial 7.62 mm machine gun. 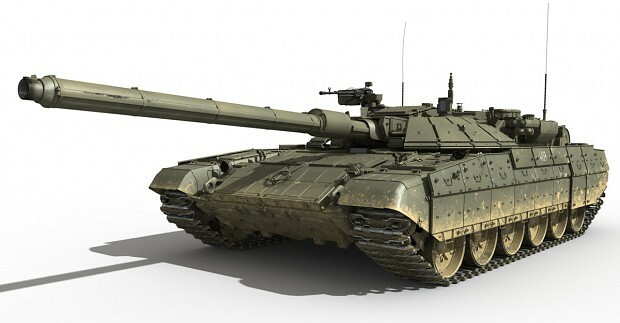 The T-90 is fitted with a “three-tiered” protection system, the first of which is composite armor in the turret that consists of a basic armor shell with an insert of alternating layers of aluminum and plastics and a controlled deformation section. The second tier is third generation Kontakt-5 ERA blocks which, along with sandwiching steel plates and composite filler, make up the turret’s forward armor package. The third tier is a Shtora-1 (“curtain”) countermeasures suite that includes two electro-optical/IR “dazzlers” on the front of the turret (the distinct Red Eyes), four Laser warning receivers, two 3D6 aerosol grenade discharging systems and a computerized control system. The Shtora-1 warns the tank’s crew when the tank has been ‘painted’ and infrared jammer jams the guidance system of some anti-tank guided missiles. The tank is powered by a 12-cylinder diesel engine that comes in the 618 kW (840 hp), 746 kW (950 hp), and 930 kW (1250 hp) varieties. Depending on the type of engine, the T-90 has an operational range of 550-700 kms (340-430 mi) and a top speed of 60–65 km/h (37–40 mph). 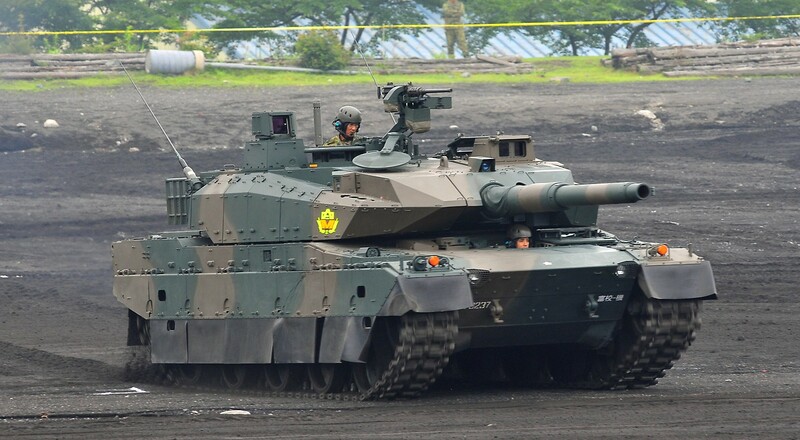 Designed to replace Japan’s aging Type 90, the Type 10 is a fourth-generation MBT and the second to be entirely developed by Japan for use by the Japan Ground Self-Defense Force. Development began in the 1990’s, the first prototypes being showcased at the 2008 Technology Research and Development Institute (TRDI), and the tank officially entered service with the armed forces by 2012. In terms of armaments, the Type 10 is believed to use a 120 mm smoothbore gun developed by Japan Steel Works, similar to the L/44, L/50, and L/55 guns licensed by Rheinmetall. The gun is capable of firing all standard 120 mm NATO ammunition, including the newly developed APFSDS round. It also has a roof-mounted 12.7 mm machine gun and a coaxial 7.62 mm machine gun. The vehicle’s armor consists of modular sections, composed of nano-crystal steel (or Triple Hardness Steel) and modular ceramic composite armor. The tank also has an auto loader which reduces the crew size to three, and comes with day and night sights as standard features. It also has the C4I (Command, Control, Communication, Computer & Intelligence) system which can be incorporated into the JGSDF network to enable sharing of information among units. The tanks is powered by a 883 kW (12oo hp) V8 Diesel engine that is capable of acheiving speeds of up to 70 km/h (43 mph) in both forward and reverse, and has an operational range of 440 km (273 mi). Also known as ZTZ-99 and WZ-123, and developed from the Type 98, the Type 99 is a third generation main battle tank (MBT) fielded by the Chinese People’s Liberation Army (PLA). Much like its predecessor, the T-99 is designed to compete with both contemporary Russian and western designs. Development began in 2001 and a prototype was unveiled at the China People’s Revolution Military Museum in Beijing during the 2007 Our troops towards the sun exhibition. The main armament is the 125 mm smoothbore gun which is capable of firing sabot APFSDS, HEAT, and HE-FRAG projectiles, as well as the Soviet AT-11 laser-guided anti-tank missiles and a specially-developed depleted uranium round. It also comes with a remotely operated 12.7 mm machine gun, a commander’s 12.7 mm machine gun, and coaxially-mounted 7.62 mm machine gun. 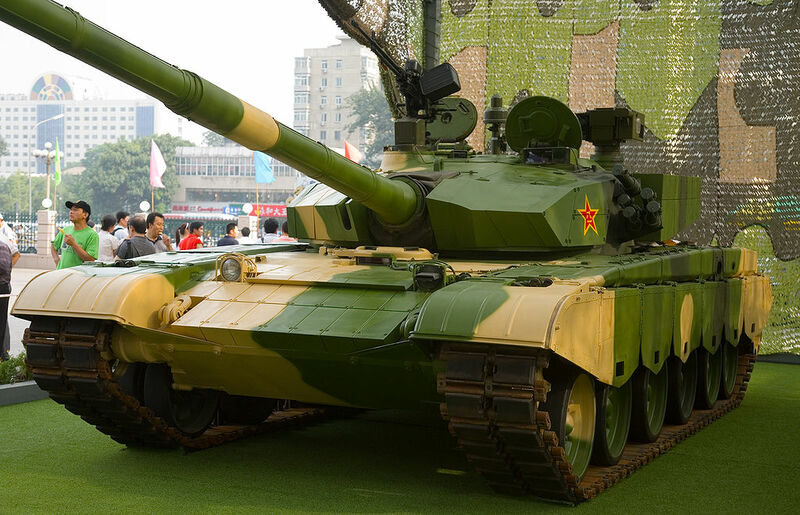 Though the nature of the Type 99’s armor protection remains classified, it is assumed to be of comparable RHA strength to other third-generation designs, as well as an experimental composite armor known as transparent ceramic. There is also observational evidence that the armor includes modular composite armor that comes in block form, or the addition of ERA blocks. Type 99KM model. The tank has a maximum speed of 80 km/h (50 mph) with an operational range of 600 km (373 mi). When looking at the full spectrum of third-generation and fourth-generation tank designs, a few common features become clear. Tanks that were conceived and designed during and after the 1970’s were all intended to take advantage of the latest in tank and anti-tank systems, and for good reason. Since their inception in the second decade of the 20th century, tanks grew in speed, lethality and versatility. Hence, countless systems were devised to knock them out. In addition to anti-tank rifles and guns that were used throughout the 1920’s and 30’s, these ensuing decades added rockets and rocket-propelled grenades. At the same time, tanks themselves began to sport larger caliber guns with increased range, velocity and more sophisticated warheads. 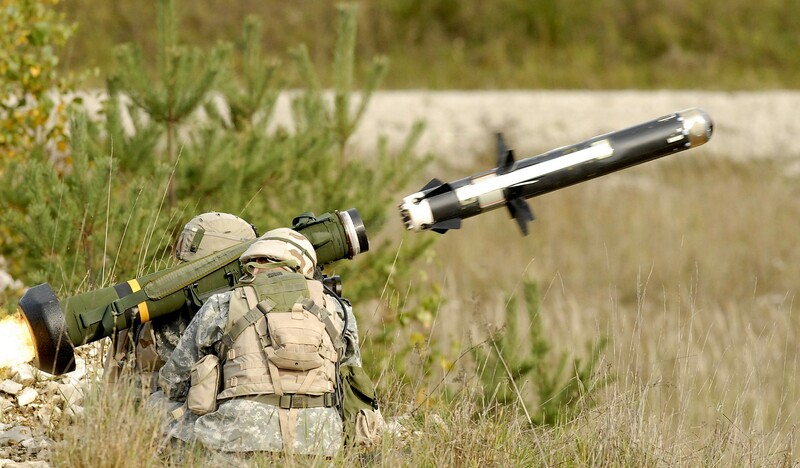 By the 1960’s, optically-tracked and computer-guided missiles were introduced and led to more rounds of innovation. This led to the introduction of composite armor, which included aluminum alloy, ceramics, depleted uranium, and rolled homogenous steel. This was developed simultaneously with the advent of depleted uranium sabot rounds, shaped charge plasma rounds, and guided missiles that could be fired from a tank gun. Basically, third-generation tanks would combined the ultimate in tank protection and anti-tank weaponry. Stabilization systems were also introduced along the way which had a revolutionary impact. Prior to their use, tanks were forced to stop driving in order to fire a shot at the enemy, which made them temporarily vulnerable. 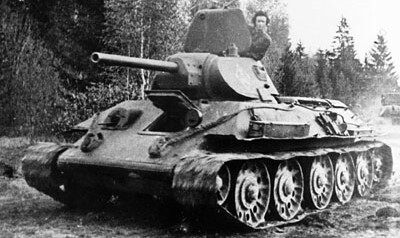 But with the new stabilizers – as well as targeting computers, night vision, and laser range finders – tanks were now extremely accurate, could fire while on the move, and could engage the enemy day or night. Today’s fourth-generation tanks take advantage of all of this, and add to it with networking capabilities, more sophisticated computers, and defensive systems that let the crew know when they are being targeted by laser-guided munitions. Armor is also becoming increasingly modular and component-based so tanks can add to their protection or strip down to lighten their loads and increase their speeds. When it comes to the future of tank warfare, the same forces appear to be at work. Basically, tank systems need to be smarter, stealthier, and more adaptable rather than simply heavier and more lethal. As such, there are numerous projects being developed by DARPA and other defense agencies around the world to create “stealth tanks”, vehicles that would be invisible to thermal imagine and could take advantage of adaptive camouflage to avoid being spotted. At the same time, there are efforts to create universal combat systems, such as a heavy military vehicle platform that can be fitted to serve in a number of roles. A perfect example of this is Russia’s Armata Universal Combat Platform, a tracked platform will be the basis for a main battle tank, a heavy infantry fighting vehicle, a combat engineering vehicle, an armored recovery vehicle, a heavy armored personnel carrier, a tank support combat vehicle or a self-propelled artillery gun. 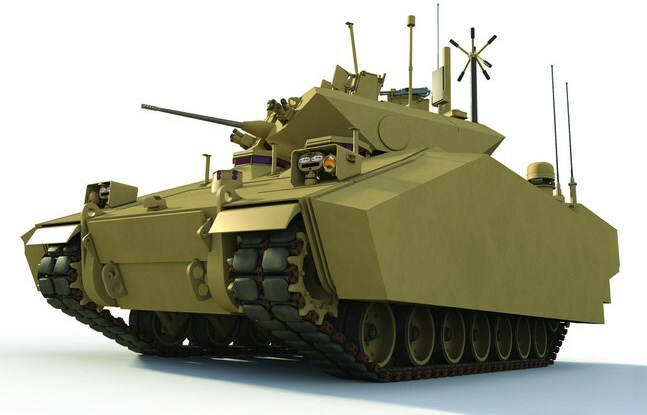 With such a system, combat engineers would be able to mount whatever turret or additional components they need to create a vehicle of their choice, one which is suited to the combat role or mission it is expected to perform. This sort of adaptability and versatility also informs ideas for a new class of AFVs (Armored Fighting Vehicles) that would be lighter, more mobile, and could be retrofitted to act as a tank, APC, IFV, command vehicle, or anything else needed. There are even plans to develop a whole new race of warmachines that would rely on a combination of avoidance, stealth, speed and maneuverability rather than heavy, modular armor for protection. Who can tell which will bear fruit ultimately? At this point though, one thing is clear: in the coming years, tanks will continue to get smarter and become increasingly networked, turning each one into a mobile command and combat platform.